Fiscal Cliff: Washington Gone Wild? Here in Washington and across the nation, all eyes are fixed on the “fiscal cliff” talks between Congress and the President. Everyone wants to know if they should expect a tax hike in just a few weeks. At year end, the so-called Bush tax rates will expire and nearly everyone will see a tax hike on January 1 unless Congress acts. Our economy is struggling, and the national wallet is bleeding dry. The deficit is over $16 Trillion. We’re out of money. There is a major split on how to fix this. Some say to raise revenue (code for taxes), while others say cut spending. The President and the Senate’s current plan is for a $1.6 trillion tax hike, a $50 billion stimulus package and authority to raise the debt ceiling without asking for approval from Congress. The House has called for increased spendingcuts and reform of the nation’s entitlements(entitlements account for 62% of the federal budget). 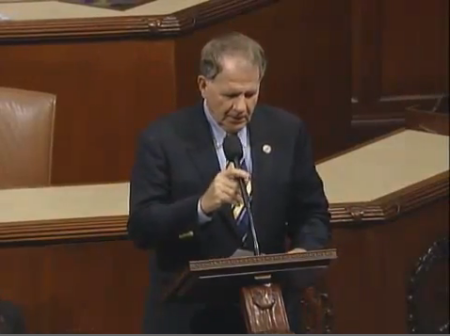 On Friday, I spoke about my thoughts of the President’s plan on the House floor. Click here to watch. H.R. 2588, the American Land Act-Requires the Administration to sell nearly ¼ of the land currently owned by the federal government to the American people. (Note: this does not include national parks or the like) The Federal Government controls over 653 million acres of land in the U.S Selling this unused land could create between an estimated $100 and $200 billion in revenue. H.R. 3103, the Pakistan Accountability Act-Prohibits the U.S. from providing financial assistance to Pakistan, except for assistance to ensure the security of its nuclear weapons. They harbored Osama bin Laden. They imprisoned the informant that told us where he was hiding. We don’t need to pay Pakistan to betray us. They’ll do it for free. H.R. 2560, which would cut and cap spending and balance the federal budget, saving $1 trillion over 10 years. H.R. 1229, which would auction off leases for domestic offshore oil and gas development and save $40 million. These are just a few ideas to get us started in finding ways to cut Washington’s bloated budget, raise revenue and not raise tax rates. As Congress and the White House continue negotiations over the next few weeks, I want to know what you think. Please take the survey on the right hand side. Your opinion is important to me. Raising taxes on the American taxpayer should be an option of last resort after all other possibilities have been exhausted. And that’s just the way it is.